The truth is out there . . . and it’s coming to Earth! Things take a turn for the paranormal at this year’s Thurston Science Fair. Six earthling teenagers find themselves taken hostage by a group of troublemaking Martians, and it’s up to intergalactic investigators, the Women in Blue, to bring them back. The Planetary Eight (P8) council will lend their support—if they can focus on one issue long enough to take a vote. Meanwhile, a Plutonian bounty hunter and his ragtag crew are tracking down a stolen warship in hopes that it will bring glory to their tiny ex-planet—and, of course, a bounty. The team from a popular YouTube channel is there to catch it all on film… or not. Can the Women in Blue rescue the missing earthlings? Will the bounty hunters find the stolen ship before its experimental black hole generator is activated? Will Pluto ever be taken seriously by the “”real”” planets? 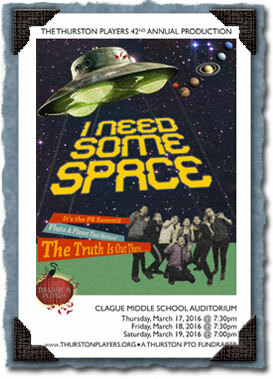 Find out in the 2016 Thurston Play, I Need Some Space.